Just as a book should (must?) 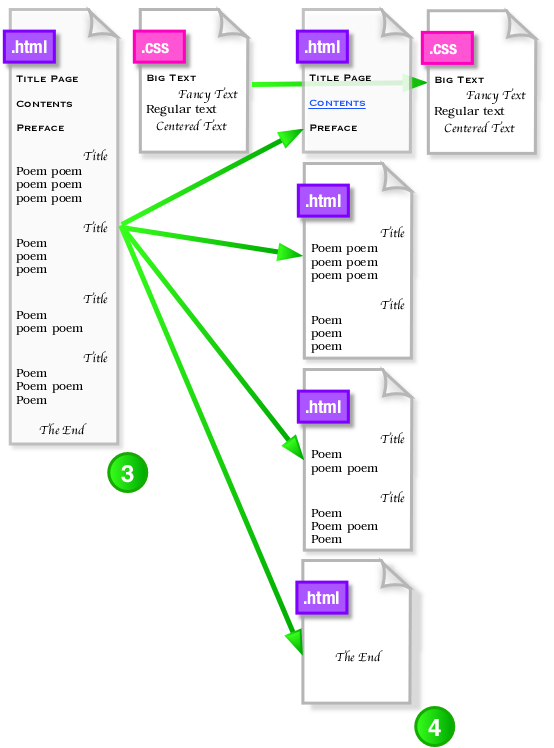 have multiple pages, an E-book should have multiple .html files. Compatibility with older E-readers. Some of the early E-books couldn’t load a file larger than 128K or 256K. Splitting our book into segments helps us keep early-adopters in the game. Easier navigation on some devices. Some devices, again, often older ones, allow the reader to “blip” ahead by section. If your anthology is all one big section, then the only “blips” allowed will be the very beginning and end of the book. Guaranteed page breaks. Sometimes, you just need to be certain that a certain line will appear at the top of a new page. Start with a fresh .html file and know that it will have a fresh page all to itself. Alternate cascading style sheets. YBR uses one CSS, but it might be that part of your book (a prose section, perhaps) will refer to a different .css file. Put that part on its own .html file and you’re good to go! Reuse of “evergreen” sections. Okay, look, the back 10 pages of every Bicycle Comics poetry E-book thus far has been 8 pages of advertising for our other E-books. We don’t want to re-write or re-code that section; we just want to pop it in. If an HTML formatting blog asks for advice regarding the formatting of the blog, will the universe explode? What do you think? It takes just a little longer on my end. Is it helpful to have the lines numbered and the syntax highlit? Or are the colors garishly distracting? Let me know. Change our HTML file to HTML5. Tidy up our HTML code automatically. Tidy up our HTML code manually. We’ll tidy up the CSS part next. Do it. We’ll be performing major surgery on these files. E-mail one to yourself. Put one on a USB thumb drive. Put one on DropBox. Redundancy defines our age. I’m starting with the file “YBR_1_MSWord_Style_Formatted.htm“. All Yellow Buick Review source files are free to download.